Tyburn Academy seniors stand by the school's sign. Here at Tyburn Academy on Clymer Street, a common goal in each classroom is to not only meet state standards, but to surpass them and enrich the educational experience of each individual student. One example of how this is accomplished can be found in our Global 9 History class, where students are given a variety of historical fiction novels to read. These novels provide our students with a vivid encounter with the past. When this happens, our students are able to move beyond observing the past as disengaged scientists and are enabled to learn the timeless lessons of the common human experience. New York state standards provide a curriculum for Global 9 that categorizes the course as a social science. As such, the past is examined by the student as a disinterested party who is taught how to compare and analyze primary sources, use and interpret data, and articulate how historical events have a causal relationship between each other. This method of approaching the past is incredibly useful and has its proper place in the historian’s toolbox, so to speak. However, to limit our approach to the past utilizing this methodology does a disservice to history and to the past. History is filled with dramatic stories of heroism and villainy, and it is precisely this element that is lost when history is restricted to being merely a social science. Without the narration of a story, many of the lessons that can be learned from the past are missed. While it is important to understand how the struggle between the Greeks and Persians in 480 B.C. contributed to a temporary political unification of the Greek city-states, or how the Crusades led to an increase of trade between Asia and Europe, ending at that level of analysis does injustice to the people who lived their lives and left behind incredible stories to tell. There is a lesson for all people of every era to learn from King Leonidas, a human being, and his personal guard of 300 Spartan warriors who held their ground at the Battle of Thermopylae against the invading Persian army, accepting death for the freedom of their people. There are also lessons to be learned from King Baldwin the Leper who, having been afflicted with leprosy from the days of his youth, did not descend into bitterness, but found the commitment and courage to command his men in battle in order to protect the crusader states of the Holy Land. To extrapolate all of the benefits from studying history, it is necessary to stimulate the imagination. This is where the use of historical fiction can be of great service. A well-written historical novel is able to recreate the world of the past in the mind of the student, with descriptions of buildings, dress, food and characters who communicate the common human experience. 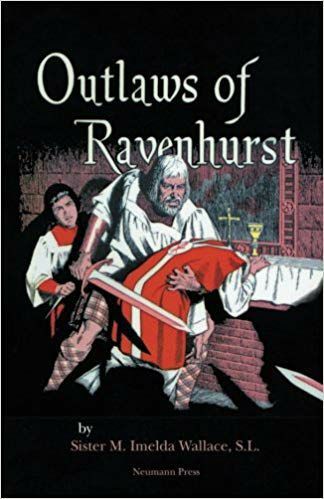 Of the historical novels assigned in our ninth grade year, one of the most popular is "The Outlaws of Ravenhurst." Written by Sister M. Imelda Wallace, "Outlaws" introduces the reader to the story of a boy named Charles Gordon, who is taken from his adopted family in 17th century Maryland and returned to his blood relatives at Ravenhurst Castle, Scotland. What ensues then is a daring adventure where Charles discovers that in post-Reformation Scotland, the rightful heir to Ravenhurst has been displaced and the Catholics of the land face persecution and grave danger. Sister Wallace does a fantastic job in this novel of weaving an intriguing story that also draws the reader into a near-tangible experience of Scotland in the 1600s. Despite the fictitious nature of the particular characters and their actions, the book does well to place the reader in the historical scenario. While Charles Gordon may have never existed, there were families who were persecuted for their beliefs in 17th century Scotland. Experiencing this fact through the lens of the story naturally leads students to ask themselves pertinent questions: “What would I do if I was in Charles’ place?” “Would I compromise my most inner beliefs when there are hostile companions around me?” History often repeats itself, and the answer to these hypothetical questions will inevitably become real scenarios. If the student is able to answer the questions in a manner similar to Charles, they can be well on their way to living a life worthy of historical note. Leonidas or Baldwin would not be worthy of remembrance if they had not led their lives with courage. By using the historical novel, Tyburn inspires her students to live a courageous life comparable to the heroes of history. Conor O'Donnell teaches theology, philosophy, history and economics at Tyburn Academy in Auburn, and also coaches basketball and organizes student activities. He is a graduate of Christendom College and is finishing his master's in theology with a concentration in sacred scripture this summer. For more information, call (315) 252-2937 or visit tyburnacademy.com.